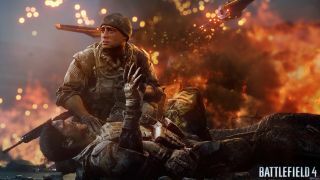 Following a leaked trailer and screenshots that snuck onto the web earlier today, EA has published the first official footage of Battlefield 4, a 17-minute snippet from the game's campaign. Some of my cohorts had a chance to see Battlefield 4 earlier tonight at the Game Developers Conference in downtown San Francisco--we'll have more thoughts and information to share soon. I wasn't there, so I'm unhelpfully unfamiliar with the context of this video, but one thing I do notice and appreciate is the use of both optics and iron sights on the player's weapon (seen at 5:00 ), a mechanic we've also seen in Red Orchestra 2 and Arma 3 . The rest of the trailer is a mixture of infantry and ground vehicle sequences around broken industrial areas around a fictionalized Baku --at the risk of sounding jaded, I didn't see anything that deviated from of the encounter templates we've seen in military FPS campaigns for years. It's an underwhelming, familiar introduction to Battlefield 4. The unexpected use of "Total Eclipse of the Heart" had me scrambling to figure out which tab was playing music, though. Hopefully EA will follow-up soon with video and information about BF4's multiplayer, which it's fair to say most of us are more invested in.